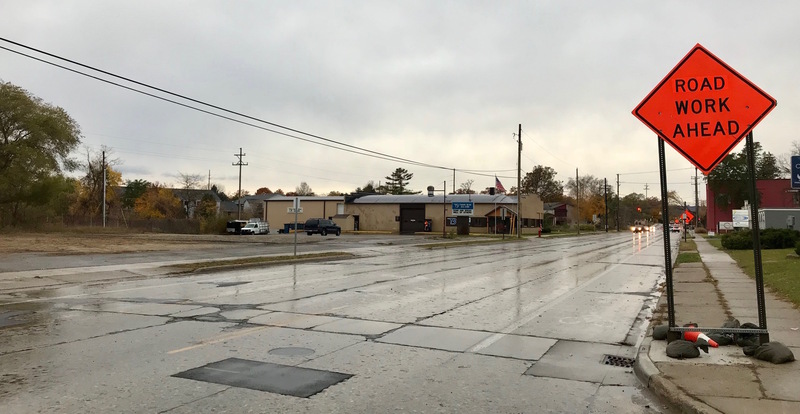 A state mandate requiring Michigan cities to replace all lead service lines in their public water supply systems could cause the planned reconstruction of Eighth Street to start two months ahead of schedule – with businesses in the corridor bracing for a potential mid-May start. Recently enacted legislation makes cities responsible for ensuring that no lead lines – or galvanized steel pipes that were once connected to lead components – are in use anywhere throughout the entire public water supply system. Though Traverse City has replaced almost all of the lead pipes in the city-controlled portion of its water system, the mandate also now makes the city responsible for replacing the privately owned service lines running through homeowners’ yards or business properties up to their buildings. While the city doesn’t have to start replacing the lines until 2020 – a project that could cost $1 million per year over two decades – City Manager Marty Colburn says staff don’t want to put in new sidewalks and cycle tracks on Eighth Street as part of the reconstruction, only to have to tear them up in a few years to replace service lines. “We were trying to hold off until after Cherry Festival (to start the Eighth Street reconstruction), but with the lead rule, it’s going to extend the length of time on the front end of the project,” Colburn says. With the city already facing a November completion date if construction started in July, staff are recommending starting in May to ensure the project can be finished before the weather turns. Under the new timetable, traffic in the corridor could reopen by the end of August, with the project finished by the end of September. One potential benefit of the change: Construction will now take place primarily during warm-weather months, decreasing the risk of weather delays posed by fall construction. Businesses are also scrambling to adjust to the new timetable, with many owners planning marketing campaigns and outreach to ensure customers – as well as their own employees – know how to reach them during construction. Eighth Street will be completely closed to all traffic from Boardman Avenue to Woodmere Avenue during the months-long project. Project Manager Brian Boals of Gourdie Fraser says his team will meet today (Monday) with the North Boardman Lake District, a group of business owners and residents in and around the Eighth Street corridor, to discuss project updates and concerns. Boals says the firm may also host one or two public open houses in April to keep the community updated on project plans and detour routes. While a detour map has not yet been released, Boals says traffic will be redirected around the corridor using Eighth Street from Woodmere Avenue up to Garfield Avenue, Garfield down to East Front Street/Grandview Parkway, and Grandview Parkway up to Union Street (or vice versa). Steve Nance, general manager of Oryana Community Co-op and part of the North Boardman Lake District, says Boals' team and city staff have been “great in being communicative and inviting stakeholders to give input on the project,” though he acknowledges the new start date puts increased pressure on businesses. “We had started thinking about contingencies and communication, but we hadn’t gotten that far because we thought we had time, so we’re just starting to dig into that,” Nance says. While Oryana is outside the actual construction zone, Nance says many of his customers – including seasonal residents who will be arriving soon and may not know about the reconstruction project – use Eighth Street to access the store. “We’re going to be focused first and foremost on being communicators,” Nance says of the store’s strategy, “using our robust social media presence and email eblasts to keep folks informed of the best routes and alternatives.” Oryana offers a five percent discount to all customers who walk, bike, carpool, or take public transit to the store, so Nance hopes that will incentivize customers to continue visiting during construction. Scott Stuhr opened Silver Spruce Brewing Company next to Family Video in November, meaning this summer will be his company’s first. He says he’s willing to consider offering discounts, incentives, or special events if traffic slows at the brewery due to construction. “Honestly, it’s not going to be very easy,” he says. “Anyone who lives here knows how to get here, but for a tourist, it might be confusing. But at least we have the alley. People can come down Wellington or Boardman, so we’re not cut off from downtown or the neighborhood. I feel bad for the businesses on the other side of the street." Pedestrians might also have a tricky time getting across the corridor. Mike McDonald is the board chair of Safe Harbor, which will shut down its emergency shelter operations on April 19 but still offer support services to those experiencing homelessness three days a week during the summer. Because the sidewalks will also be torn up as part of the Eighth Street rebuild, pedestrians may have to go down to Woodmere to get to Station Street and access the shelter. “Our guests for the most are usually walking anyway, so we don’t see it as a big issue,” says McDonald. “As long as (the city is) done by November 1, we’re in good shape.” Boals says construction crews will work to ensure the corridor is secured from a safety perspective each night, acknowledging pedestrians may dart across the road after crews leave. Despite the headaches and financial hits businesses are likely to incur during construction, owners almost universally voiced their support for the construction. “We know it needs to happen, we just hope it doesn’t cut into business too much,” says Stuhr. Nance agrees. “There will be some short-term pain, but in the end, we’ll have a vital and vibrant Eighth Street that will be hopefully be like a locals’ Front Street, with a lot of diversity and things to do,” he says.